The perfect bath salt to care for the largest organ in your body- your skin! 100% pure Pacific Sea Salt and mineral-rich Dead Sea Salt is the foundation for this skincare treatment bath soak with organic lavender essential oil- which holds its own beneficial properties for the skin! This salt for skin helps to relieve dry skin and soothe irritated skin, leaving it softer and more supple with a healthy, radiant glow. 100% Natural blend of Pacific Sea Salt and Dead Sea Salt scented with Organic Lavender Essential Oil, in a natural white color. 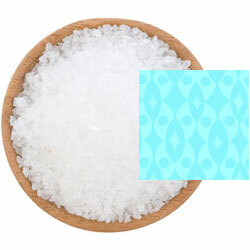 Benefits: A therapeutic bath salt for general skincare benefits. Also promotes relaxation for a good night's sleep while soothing muscle aches and pains. Ingredients: Pacific Sea Salt, Dead Sea Salt, Simmondsia Chinensis (Jojoba) Seed Oil, Lavandin Hybrida Grosso (Organic Lavender) Essential Oil, Tocopherol (Vitamin E), Aloe Barbadensis (Aloe Vera) Leaf Juice.